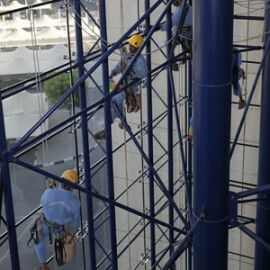 Cleanco as an IRATA certified company has established itself as one of the leading rope access service providers in the Middle East. Cleanco holds years of experience in providing innovative and cost effective rope access solutions and carrying out maintenance, inspection and cleaning services to various sectors. 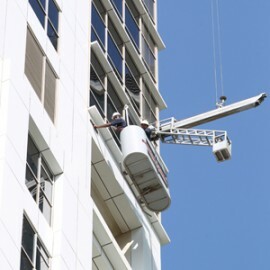 We specialize in providing safe access solutions to high rise buildings and any premises that present an access problem for window cleaning or building maintenance. Our Rope Access Services are supported by our comprehensive Safety Management System that ensure every element of our operations is conducted in a controlled environment so as to afford our personnel and the project, with the minimum of risk in their work. It is in our policy to ensure that the highest standards of efficiency is displayed in our workmanship. We adhere strictly to our aim of providing economic and high quality service solutions. All projects and jobs undertaken are supervised and managed on a daily basis. Inspection and audits are undertaken by our operations managers to ensure quality of work.